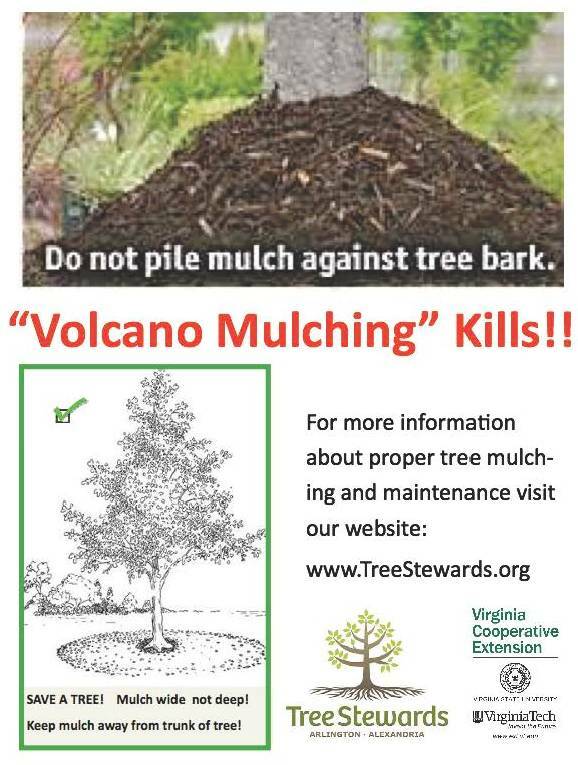 Lucy Spencer’s flyer is distributed with mulch sold for local high school fundraiser. TreeSteward Lucy Spencer is determined to educate her neighbors on the dangers of piling mulch high on tree trunks. When she learned the local high school sports team spring fundraiser was selling bags of mulch, she knew this was ideal targeted education. She developed a flyer with instructions for the correct way to mulch and has arranged for it to be distributed with each purchase. A wide ring of mulch around trees is a good thing – it keeps lawnmowers and weed wackers away while it helps hold moisture in the ground. If organic wood chips and leaves are used, they will break down and create nutrients and soil. The danger of mulch is when so much is piled around the trunk, creating a habitat for bugs and encouraging improper root growth. Mulch wide and out – not up. This entry was posted in Community Service, Tree Care and tagged mulch, tree care. Bookmark the permalink.